Reader Contribution Du Jour: A Falafel Pandemic? So we have established that on top of the fabulous lady who sells falafel at the corner of Milton and Manhattan Avenue, Bagels On the Run and (presumably) a new Middle Eastern place at 849 Manhattan Avenue will be serving up these chickpea laden delights. Well, as I learned this morning it doesn’t stop there. there must be a falafel pandemic in the point, cause I just saw this on nassau btwn eckford & leonard, where lucky 7 deli was, the little-known beer-specialty deli. 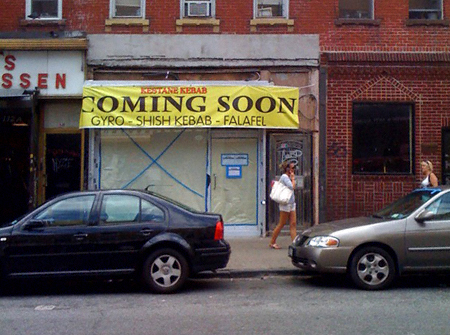 Could Kebabs be Greenpoint’s new “Thai”?